I am really loving pineapple this year. I mean loving it so much that I made a Pineapple Gift box and had to make another because I couldn’t bear to part with the first one! I am not even kidding! 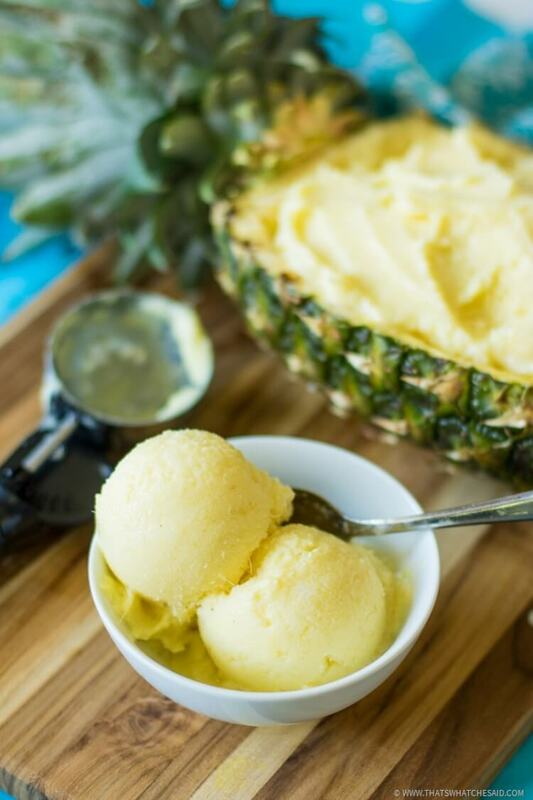 This delicious pineapple frozen yogurt was adapted from my 4 ingredient Peach Frozen Yogurt. It’s light, it’s creamy and it’s amazing! To start out get a fresh pineapple. I look for a heavy pineapple that is firm, but still has a bit of give when I squeeze it. 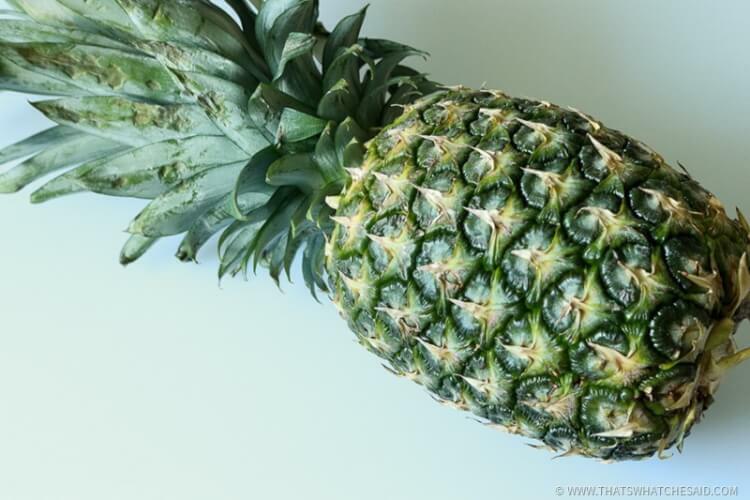 It’s OK if the pineapple is still green, that does not mean it’s under-ripe. I also give it a good sniff (close to the bottom of the pineapple) You will know it’s a good one when it smells sweet and pineapple-y! <—yep that’s a word! Slice the pineapple in half long ways and then I use a knife and cut slices in the flesh of the pineapple in crisscrosses, making sure to NOT cut through the shell of the Pineapple if you want to use it as a serving dish! Note: Pineapple’s have cores so I just kind of cut around that. 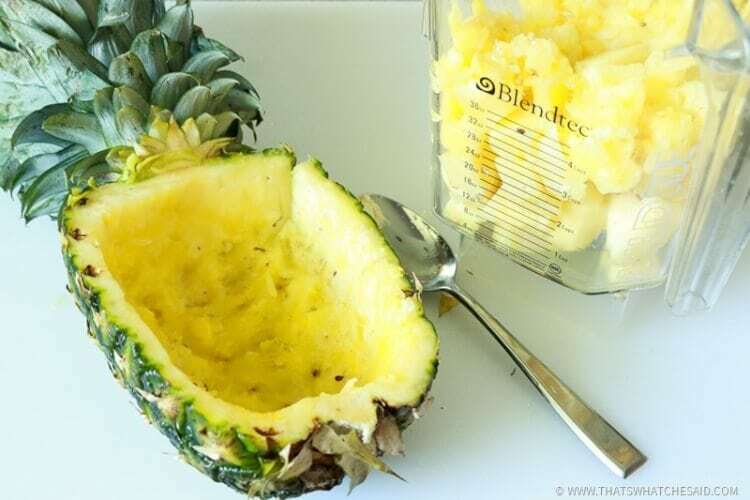 I then use a spoon to scoop out the flesh of the pineapple and add it to my Blendtec Blender Pitcher. Then, I added 1 small single serve container of vanilla Greek yogurt to the blender as well as the honey. I blended until it was smooth and creamy. 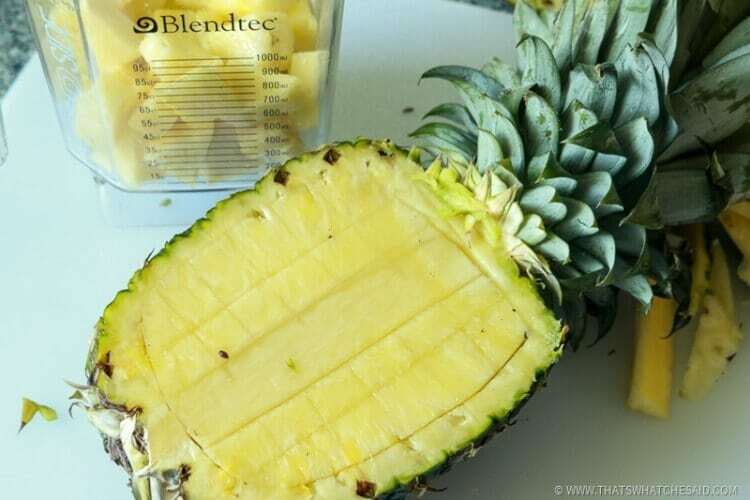 Pineapple is fibrous so be sure to blend it really well. I also strained through a mesh strainer to catch any of those fibers that didn’t get blended. Pour into a loaf pan and place in the freezer for an hour. You can also pour into popsicles or ice cube trays at this point and be done! 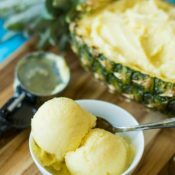 If you want scoopable pineapple frozen yogurt keep on reading! After an hour, I take it out and mix it up again with a spoon and I repeat this maybe 2 more times. This keeps the frozen yogurt from getting a hard icy layer on the top. Pineapples do contain a lot of water. 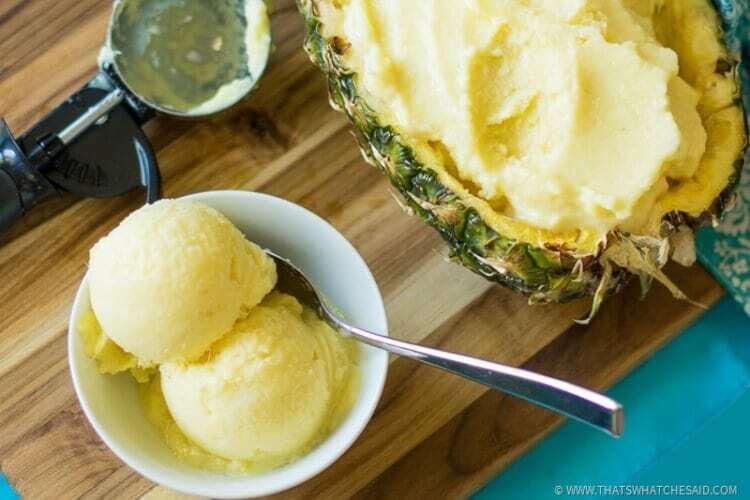 From here you can scoop the pineapple frozen yogurt into the hollowed out pineapple shell for a super fun serving dish. This is also my afternoon indulgence. I can fully enjoy it knowing this snack is free of all preservatives and additives and it’s healthy! 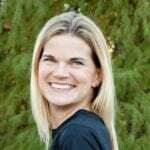 I didn’t do all that work using the 21 Day Fix to throw it all away and I was not ready to throw away my afternoon snack! It’s a win-win. 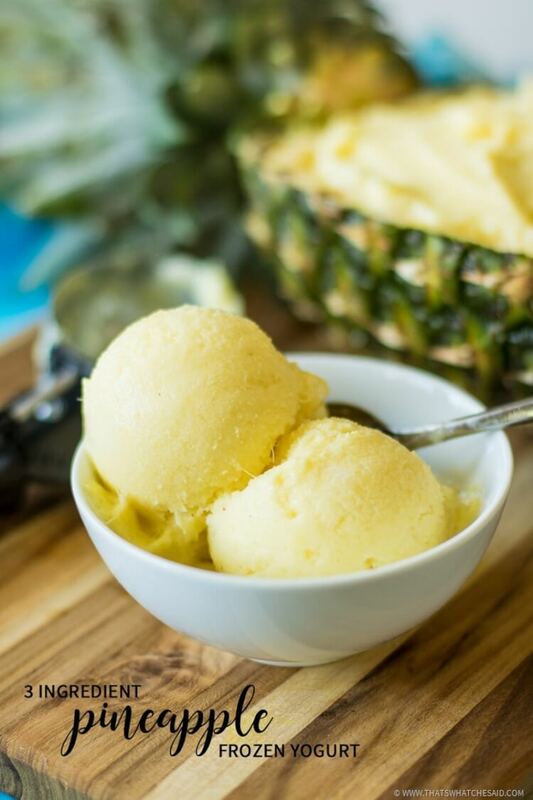 A creamy and sweet pineapple frozen yogurt made from fresh pineapple will soon become your new healthy indulgence! Slice Pineapple in half and score flesh with a knife. Remove flesh cubes using spoon and place into blender. Add honey and yogurt to blender and blend until smooth and creamy. Honey amount will depend on the sweetness of your pineapple. 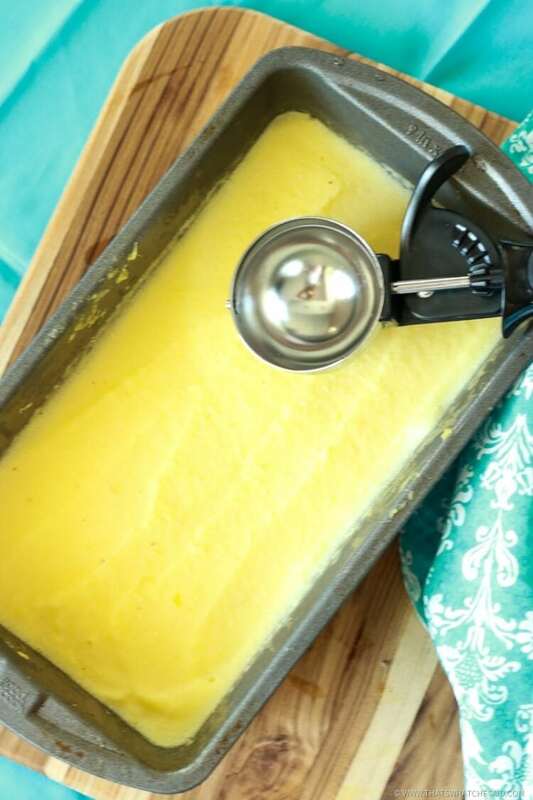 Pour into a loaf pan and freeze for 1 hour. Mix the yogurt and return to freezer. Repeat this for 3 more hours. Serve from loaf pan or transfer to hollow pineapple shell for serving. Don’t want to go to the grocery store? Use code CSPANGENBERG13D1DD at InstantCart and we both get $10 off our order! They deliver! Or use Walmart Online Grocery. 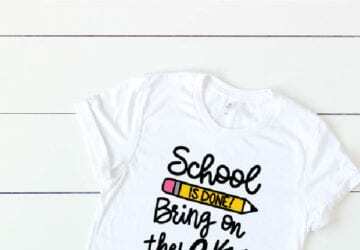 They shop, you pick it up and get $10 off your order as well! New customers only! 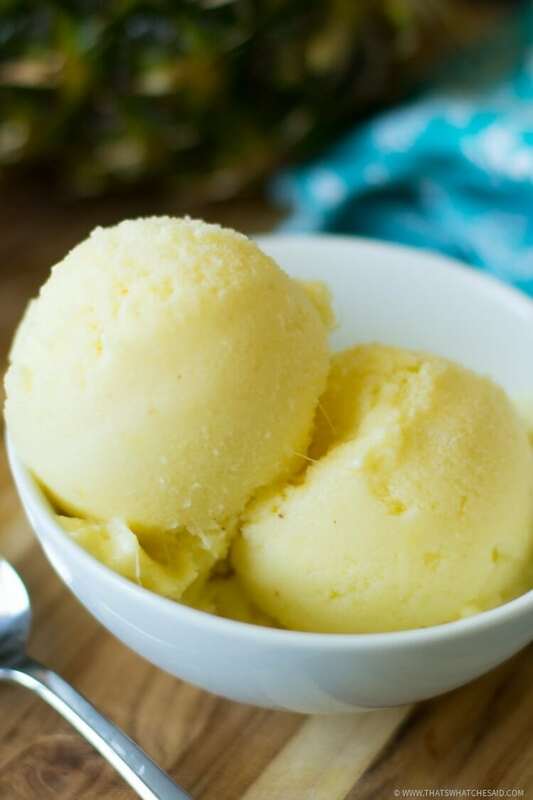 Be sure to check out all my Frozen Desserts! 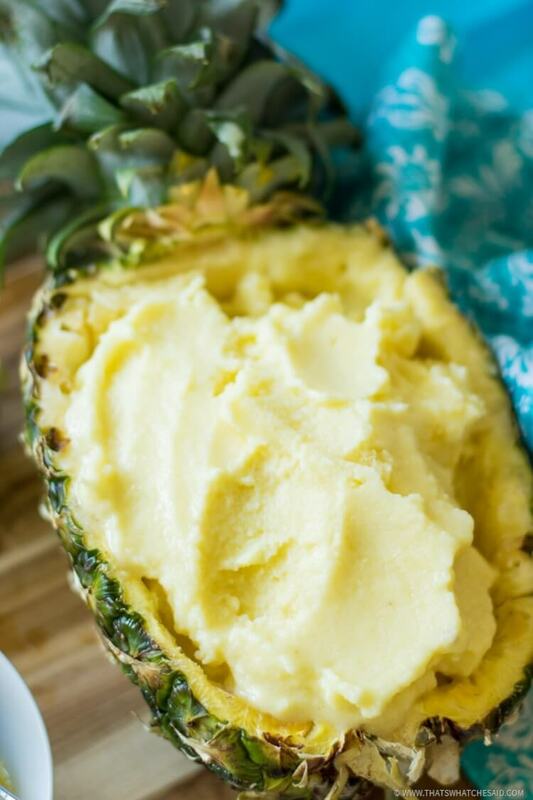 I just want to be clear before we try this…so one single serving yogurt for each pineapple you use? If your pineapple is not very ripe, I would add a squeeze or two of lemon juice to cut the bitter taste. Cheryl this is really a easy-to-follow recipe. I am going to try this soon. I´m from Germany. How much is “one single serving yogurt” in your country? Here it´s 150 g – would that be the amount you use? Yes Maam! 150g is the equivalent to our 5.3 ounce single servings! I will clarify that above! Thanks for asking!! 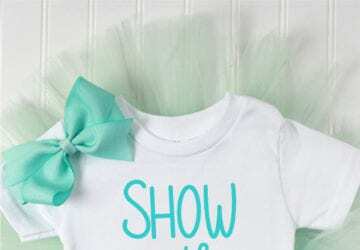 I hope you love this as much as we do!